The DLL utilizes a ready-made C-class for A* handling, done by Lee Thomason (www.grinninglizard.com). It is named “micropather”, and fast and rather easy to use. 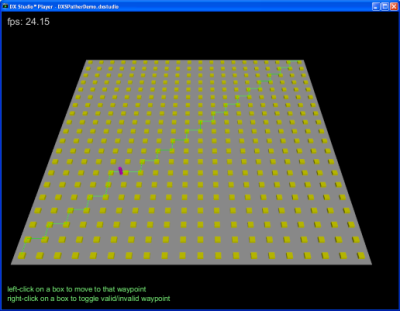 If you’d ever need some C-code for pathfinding, that thing is the way to go, imho. This implementation of the DLL executes the calculation of a certain path request within one call. For rather large maps (waypoint numbers), this may cause a single “hickup” condition in the DXStudio doc. The waypoint attribute buffer (not the waypoints themselves) is dynamic, so you can make single waypoints “valid” or “inaccessible” by calling functions, and these conditions will be considered at the very next waypoint calculation request. Allowed movement directions are adjustable, too. So, you could e.g. choose to have a path calculated only by moving “diagonal” (X+/-1 AND Y+/-1) and “left-right” (X+/-1 ONLY), but not “up-down” (Y+/-1 ONLY), which could be useful for hexagon maps. DXStudio users would not call DLL functions directly, but use “wrappers” provided in DXSPather.js. Note that waypoints (that you need to submit to the DLL once) need to be in regular grid order (e.g., in a regular [X,Y] indices format). Not necessarily do the waypoints’ distances need to be evenly spaced. (added with v1.3) Set the path to the dll inside the wrapper script. Usually, this would be something like system.folders.document. No return value. (name changed with v1.2) Tells the path calculator if it should consider diagonal movements (X and Y index both change). Switching is possible by this function (changes will be valid on the very next path calculation). Returns always true. (added with v1.2) Tells the path calculator if it should consider vertical movements (Y index changes only). This could be useful when processing paths on hexagon grid maps. Switching is possible by using this function (changes will be valid on the very next path calculation). Returns always true. (added with v1.2) Tells the path calculator if it should consider horizontal movements (X index changes only). This could be useful when processing paths on hexagon grid maps. Switching is possible by using this function (changes will be valid on the very next path calculation). Returns always true. This call resets the DLL data and prepares a (yet empty) X*Y waypoint grid to be filled later on. Returns false on error, true on success. Sets the basic data of one waypoint “node”. Submit its indices in the (regular grid’s) waypoint array (iIndexX, iIndexY), as well as its positions in 3D space (fPosX, fPosY, fPosZ). This data has to be submitted once before any path calculation requests, and remains stored inside the DLL. Returns false on error, true on success. (added with v1.3, EXPERIMENTAL) Sets an optional factor for a waypoint that will be considered when calculating paths. Use this to make certain waypoints more or less “desireable” for a path. E.g., a fCostModifier of 2.0 would make a waypoint more “uneasy”, while a modifier of “0.5” would make this waypoint being prefered. By default, the cost modifier for each waypoint is “1.0f” (which is a neutral factor). Experimental feature. Setting values here might cause weird paths to be created. Makes a certain waypoint “walkable” (being considered in path calculations) – or disables it. Data can be dynamically changed (read: whenever you need), and will be consided at the very next path calculation. Returns false on error, true on success. This routine initiates a path calculation, taking the “from” and “to” waypoint indices as arguments. As soon as this call returns, the calculated path is available in (global) variables inside the include js script (see below). The download comes with a DXStudio demo doc, where you can select a path of an object. The available waypoints are shown as boxes. DXSCheckMem is a DLL I once wrote to track dynamic memory usage changes of DXStudio documents. It can be called on a per-frame basis from JS script, and adds only little overhead to the fps (if at all). This is my first try to create a re-usable module for Worldweavers DXStudio. It is a laser cannon with targetting functions, some visual effects and sound. As for it’s quality, it might not completely fit your needs or standards out-of-the-box (especially for the texturing), but could maybe work as your base for own modules (I hope). 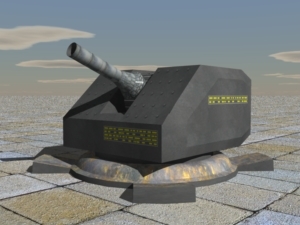 Given a target 3D coordinate, the cannon will automatically align to this target, playing some mechanical sound. Speed of rotations can be adjusted. If requested, a laser beam will be initiated after alignment has completed. Automatically, there is a check if some scene object is hit. If so, an explosion animation will be started, accompanied by a corresponding sound. In case a scene object has been hit, a notify message is sent to the parent scene. The module (‘object’) must not be rotated upon placing. It does only work when positioned on the XZ-plane. Different heights (Y) do work, though. It can be scaled in the scene editor. The cannon will not target positions that are too near (e.g., touching its own bounding box) or can not be aligned by the cannon tube (e.g., too low in y dimension). If a shot is being executed, alignment to new target positions will take place after having finished the shot. This must be called before using the module. Pass the module’s id (e.g. ‘objects.CannonModule_1.id’) as parameter. Set the maximum range the laser beam can shoot (that is the range a hit detection will be done – and the length of the beam if nothing is hit) and the duration of a shot (in seconds). With this, set the turn speed and the speed of the cannon tube’s up/down movement (deg/sec). Used for alignment. Set a new 3D coordinate target position. The cannon will align to that, but not shoot. No movement will happen if the target position can not be aligned to. 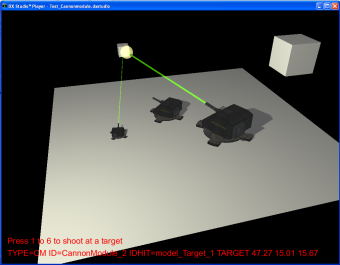 Same as before, but the cannon will initialize a laser shot after having focused the target coordinates. Stop a currently running alignment movement (if any). Returns true if the cannon is in the process of alignment to a given target coordinate. False, if not. Initiate a laser shot. Will stop any alignment movement immediately, if present. Whenever a hit is detected, scene.moduleNotify(msg) of the parent scene will be called. Passing TYPE of the event (=CM aka CannonModule), ID of the module and the beam hit position TARGET. Possible target objects must have their selectionMask set to 2 (bit1 = 1). Use ‘eval()’ in moduleNotify function. Please see the .dxstudio demo program for a detailed usage demo.